byname of PIETRO DI CRISTOFORO VANNUCCI Italian early Renaissance painter of the Umbria school, the teacher of Raphael. His work (e.g., "Giving of the Keys to St. Peter," 1481-82, a fresco in the Sistine Chapel, Rome) anticipated High Renaissance ideals in its compositional clarity, sense of spaciousness, and economy of formal elements. 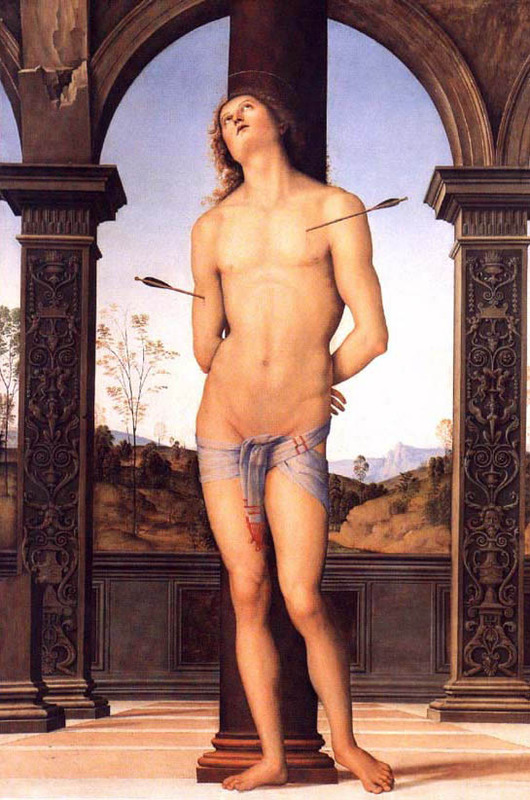 The first certain work by Perugino is a "Saint Sebastian," at Cerqueto, near Perugia. This fresco, or mural painted on plaster with water-dissolved pigments, dates from 1478 and is typical of Perugino's style. He must have attained a considerable reputation by this time, since he probably worked for Pope Sixtus IV in Rome, 1478-79, on frescoes now lost. Sixtus IV also employed him to paint a number of the frescoes in the Sistine Chapel in the Vatican Palace. Completed between 1481 and 1482, three narrative scenes behind the altar were destroyed by Michelangelo in 1535-36 in order to use the space for his fresco of the "Last Judgment." 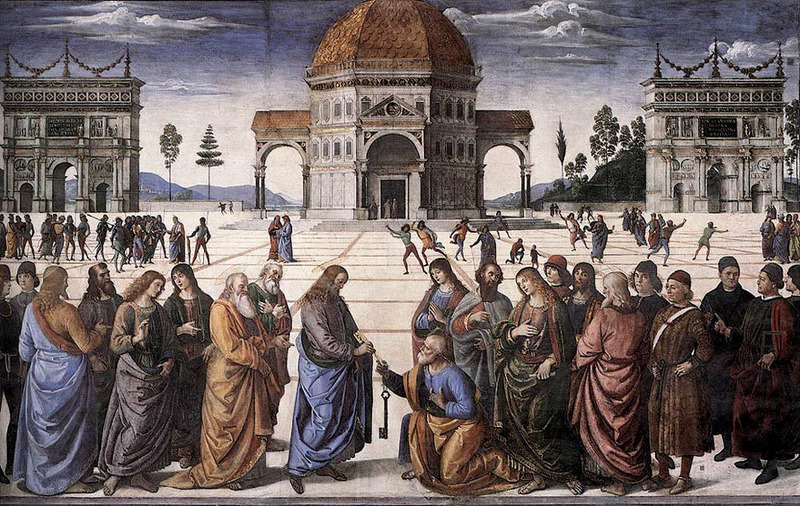 Of the scenes completely by Perugino's own hand, only the fresco "Giving of the Keys to St. Peter" has survived. The simple and lucid arrangement of the composition reveals the centre of narrative action, unlike the frescoes in the same series by the Florentine painter Sandro Botticelli, which, in comparison, appear overcrowded and confused in their narrative focus. 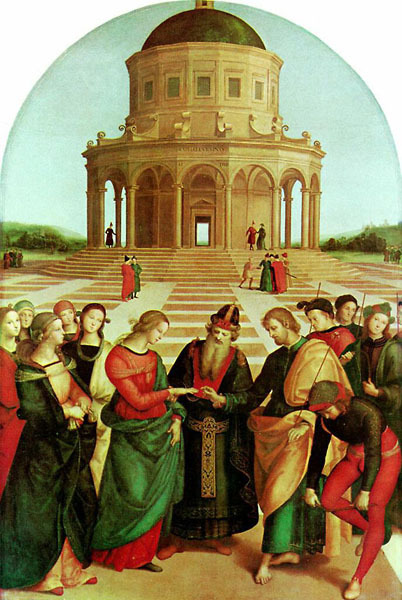 After completing his work in the Sistine Chapel, Perugino returned to Florence, where he was commissioned to work in the Palazzo della Signoria. In 1491 he was invited to sit on the committee concerned with finishing the Florence cathedral. "Perugino." Britannica 2001 Standard Edition CD-ROM. Copyright © 1994-2001 Britannica.com Inc. November 30, 2002. Fresco in the Sistine Chapel, Vatican, Rome. 1482. 11'5.5" x 18' Make sure you read Stokstad's analysis of this work.Form: Perugino's fresco is an excellent synthesis of many different kinds of formal perspectives. The use of linear perspective in this image places the vanishing point directly in the center of the picture plane and directly in the doorway of the temple in the center of the image. The linear perspective is further enhanced by the use of the gridlike pavement that stretches across the picture plane and the use ofatmospheric perspective. There is also a consistent use of chiaroscuro across the picture plane which unifies the illusion of a consistent space. Iconography and Context: First and foremost this image provides us with a theological perspective in that the image centers around Jesus' passing his authority down to Peter. In this instance, the point of view is decidedly Catholic in how it supports the Roman papacy of Sixtus IV. We also see an idealistic and neoplatonic perspective in the depiction of an idealized or an imaginary space (which Stokstad discusses in some detail) and the depiction of ideal and classical architectural forms. Notice that the buildings in the background are based on Roman building forms. The two structures flanking the center building are both Roman triumphal arches. The use of arches for a monument is an expression of Roman technology and therefore Roman genius. The triumphal arch is a common symbol that is dedicated to the victories of particular emperors. The building in the center looks very much like the Pantheon in Rome and this is no accident. The use and creation of central plan churches really took off during the Renaissance. When Jesus went into the region of Caesarea Philippi he asked his disciples, "Who do people say that the Son of Man is?" Simon Peter said in reply, "You are the Messiah, the Son of the living God." Then he strictly ordered his disciples to tell no one that he was the Messiah. From that time on, Jesus began to show his disciples that he must go to Jerusalem and suffer greatly from the elders, the chief priests, and the scribes, and be killed and on the third day be raised. Then Peter took him aside and began to rebuke him, "God forbid, Lord! No such thing shall ever happen to you." He turned and said to Peter, "Get behind me, Satan! You are an obstacle to me. You are thinking not as God does, but as human beings do." Then Jesus said to his disciples, "Whoever wishes to come after me must deny himself, take up his cross, and follow me. What profit would there be for one to gain the whole world and forfeit his life? Or what can one give in exchange for his life? Amen, I say to you, there are some standing here who will not taste death until they see the Son of Man coming in his kingdom." During the Renaissance the ideal church plan tended to be centralized; that is, it was symmetrical about a central point, as is a circle, a square, or a Greek cross (which has four equal arms). 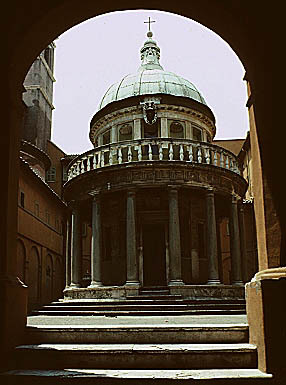 Many Renaissance architects came to believe that the circle was the most perfect geometric form and, therefore, most appropriate in dedication to a perfect God. The book On Painting, which he wrote in 1435, set forth for the first time the rules for drawing a picture of a three-dimensional scene upon the two-dimensional plane of a panel or wall. It had an immediate and profound effect upon Italian painting and relief work, giving rise to the correct, ample, geometrically ordered space of the perspectival Renaissance style. Later perspectival theorists, such as the painter Piero della Francesca and Leonardo, elaborated upon Alberti's work, but his principles remain as basic to the projective science of perspective as Euclid's do to plane geometry. the classic text of Vitruvius, architect and architectural theorist of the age of the Roman emperor Augustus. With customary thoroughness, Alberti embarked upon a study of the architectural and engineering practices of antiquity that he continued when he returned to Rome in 1443 with the papal court. By the time Nicholas V became pope in 1447, Alberti was knowledgeable enough to become the Pope's architectural adviser. The collaboration between Alberti and Nicholas V gave rise to the first grandiose building projects of Renaissance Rome, initiating among other works the reconstruction of St. Peter's and the Vatican Palace. As the Este prince was now dead, it was to Nicholas V that Alberti dedicated in 1452 the monumental theoretical result of his long study of Vitruvius. This was his De re aedificatoria (Ten Books on Architecture), not a restored text of Vitruvius but a wholly new work, that won him his reputation as the "Florentine Vitruvius." 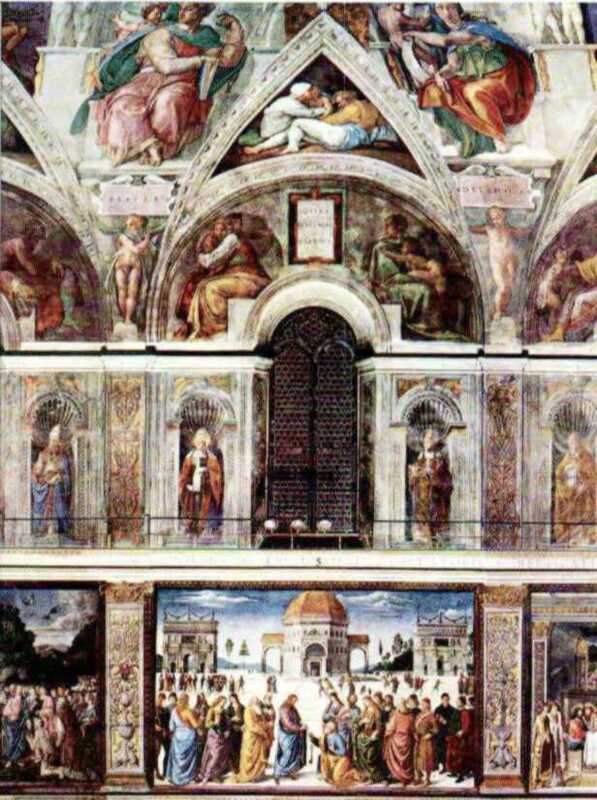 It became a bible of Renaissance architecture, for it incorporated and made advances upon the engineering knowledge of antiquity, and it grounded the stylistic principles of classical art in a fully developed aesthetic theory of proportionality and harmony. "Alberti, Contribution to philosophy, science, and the arts." Britannica 2001 Standard Edition CD-ROM. Copyright © 1994-2001 Britannica.com Inc. November 30, 2002. OK. So now you probably want to know who Vitruvius was. Vitruvius's ideas were first published in his De architectura. The De architectura was then republished many times during the Renaissance and used by such artists as Leonardo who expresses Vitruvius's ideas in his Vitruvian Man. fl. 1st century BC in full MARCUS VITRUVIUS POLLIO, Roman architect, engineer, and author of the celebrated treatise De architectura (On Architecture), a handbook for Roman architects. Little is known of Vitruvius' life, except what can be gathered from his writings, which are somewhat obscure on the subject. Although he nowhere identifies the emperor to whom his work is dedicated, it is likely that the first Augustus is meant and that the treatise was conceived after 27 BC. Since Vitruvius describes himself as an old man, it may be inferred that he was also active during the time of Julius Caesar. Vitruvius himself tells of a basilica he built at Fanum (now Fano).De architectura was based on his own experience, as well as on theoretical works by famous Greek architects such as Hermogenes. The treatise covers almost every aspect of architecture, but it is limited, since it is based primarily on Greek models, from which Roman architecture was soon decisively to depart in order to serve the new needs of proclaiming a world empire. De architectura is divided into 10 books dealing with city planning and architecture in general; building materials; temple construction and the use of the Greek orders; public buildings (theatres, baths); private buildings; floors and stucco decoration; hydraulics; clocks, mensuration, and astronomy; and civil and military engines. Vitruvius' outlook is essentially Hellenistic. His wish was to preserve the classical tradition in the design of temples and public buildings, and his prefaces to the separate books of his treatise contain many pessimistic remarks about the contemporary architecture. Most of what Pliny says in his Natural History about Roman construction methods and wall painting was taken from Vitruvius, though unacknowledged. Vitruvius' expressed desire that his name be honoured by posterity was realized. 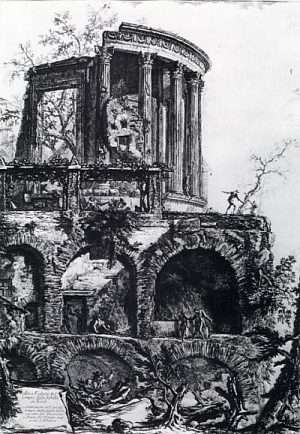 Throughout the antique revival of the Renaissance, the classical phase of the Baroque, and in the Neoclassical period, his work was the chief authority on ancient classical architecture. The text of De architectura with an English translation is published in the Loeb Classical Library in two volumes. "Vitruvius." Britannica 2001 Standard Edition CD-ROM. Copyright © 1994-2001 Britannica.com Inc. November 11, 2002. Make sure you read Stokstad's description. She uses some very precise terminology to describe the structure. 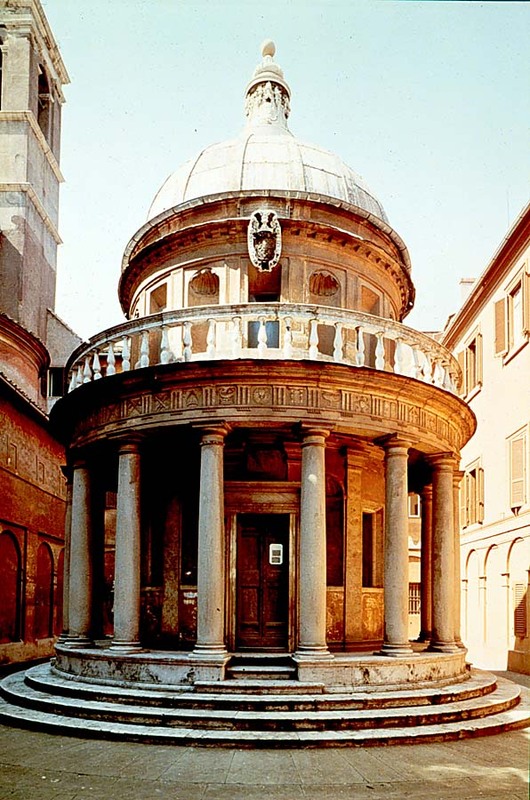 Form: This small temple is a kind of cross between the Pantheon and the Parthenon. It has a dome and is a central plan like the Pantheon but uses a different order, the Doric as in the Parthenon. It is also contained within a small courtyard that was not part of its original design. Originally, the building was to be placed in a circular colonnaded courtyard which was designed to "set off" the design of the temple itself. According to the Brittanica, the building was "specifically inspired by the temple of Vesta at Tivoli."